These 3 Assembly Leg Bushings from Manfrotto are mounted on the tripod's leg tubes and ensure a secure lock when the flip locks are engaged. They are sold here as a replacement or spare part for select tripods. Compatible with the following tripods: 190CX3, 190CXPRO3, 190CXPRO4, 190CXPRO4B, 190CXV3, and 756CX3. Box Dimensions (LxWxH) 7.5 x 4.0 x 0.7"
Assembly Leg Bushings for Select Tripods (Set of 3) is rated 5.0 out of 5 by 1. Rated 5 out of 5 by Anonymous from Buchas trip Manfrotto Excelente produto. 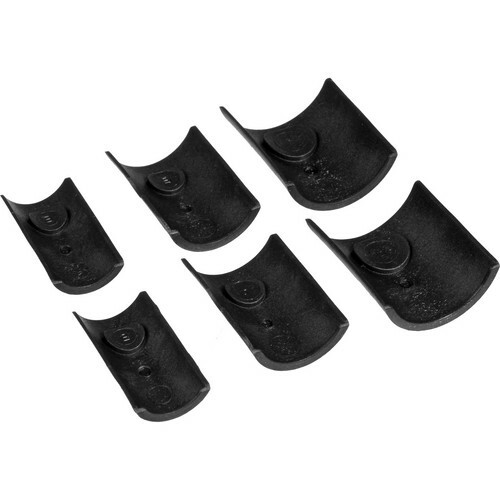 will this bushing set work for Manfrotto 190GO carbon fiber tripod? Unfortunately, these bushings are not compatible with the 190GO! tripod. I could not answer. I bought it to fit in another old tripod model. Will these work on the Manfrotto 055CXPRO3?